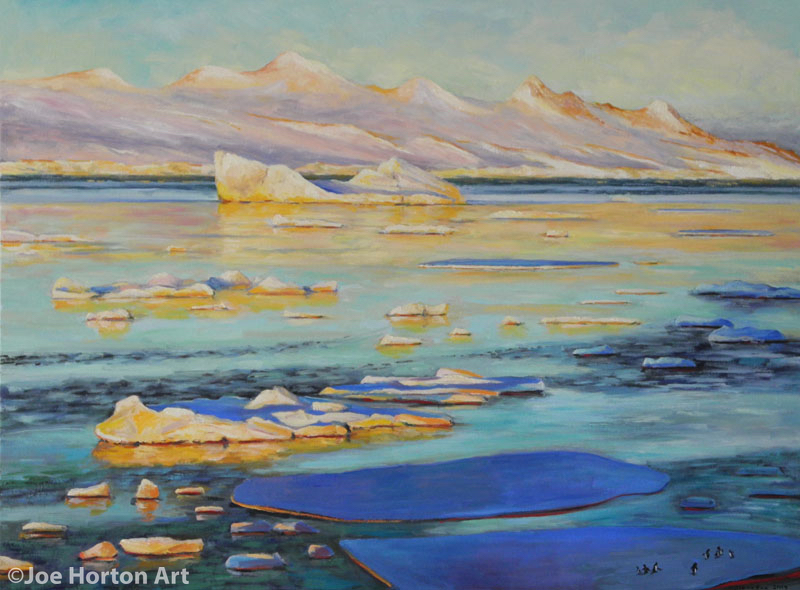 I am exhibiting 11 oil paintings of Antarctica at the Leonard Helman Bridge Center in Santa Fe. Mike and I took two trips to Antarctica in 2013 and 2015. With the scorching heat here in Santa Fe, the paintings help to cool down the bridge room especially when the club has been having trouble with the air conditioning. I am donating 10 percent of sales to the bridge club. The show will be exhibited until August 1. It is winter in New Mexico (one of my favorite times of year) and to celebrate, I am having a one man show of my winter landscape scenes at the Leonard Helman Duplicate Bridge Club in Santa Fe, NM. If you are in the area, come by and check them out! I will be showing them until January 3, 2018 and 10% of all sales will go to the bridge club. My painting, "The Telephone Call", was selected for inclusion in the Cultural Council of Palm Beach County's 2017 Biennial Art Show. The show runs from June 9 through September 2, 2017. There were 194 artists who applied to the exhibit with a total of 627 works of art. 40 artists were chosen with 49 works of art hung for the show. All artists are residents of Palm Beach County. If you are in the Palm Beach area, stop by to see all the great pieces. 2016 was a very productive year. I sold 30 oil paintings and created several new pieces (be sure to visit my New Work section). I gave a one man exhibition in March at the Jewish Community Center in Palm Beach Gardens which featured oil paintings of the northeast, Cape Cod, Vermont and New Hampshire. I also participated in a members' exhibit at the center, receiving first prize for a painting entitled "The Telephone Call". In Santa Fe, I exhibited an additional 23 paintings. Here is wishing everyone a wonderful holiday season and a bright and happy New Year! In the spirit of the season (and my love of bridge), I am showing some of my autumn landscape pieces at the Leonard Helman Duplicate Bridge Club in Santa Fe, NM. If you are in the area, come by and check them out! I will be showing them through the end of October. One of my new pieces titled "The Telephone Call" took first prize on May 10, 2016 at the Mandel Jewish Community Center of the Palm Beaches. It was a pleasure to receive the recognition and get to share my work with the community. While you can currently view my work at my One Man Exhibition at the Lyon Gallery at the Mandel Jewish Community Center, March 29 to April 28, 2016, Palm Beach Gardens, Fl, I will also have another show at the Lighthouse Art center, Tequesta, Fl, this May and June 2016. I will be showing a collection of my work at the Mandel Jewish Community Center from March 29th through April 18th. The show is titled "From My Point of View" Oil Paintings from Around the World. If you are in the Palm Beach Gardens area, please come see my work in person! I took a wonderful trip to New England last fall and was truly inspired to capture the beautiful landscapes and colors. The fruits of my inspiration have been added to the site - look for them under "New Work".